One of the leading European newspapers, Le Matin, of Paris, describes G. Gordon Liddy as "a man of fantastic intelligence and complexity." Educated privately by Benedictines and Jesuits, Mr. Liddy earned a B.S. degree from Fordham University and an Ll.D. from the Fordham Law School, graduating as an editor of The Fordham Law Review. After two years service as an Army artillery officer during the Korean War, Mr. Liddy entered the FBI as a Special Agent, rapidly earned multiple commendations from the late J. Edgar Hoover and, at age 29, became the youngest Bureau Supervisor at FBI national headquarters in Washington, D.C., where he served during the Eisenhower and Kennedy administrations. Mr. Liddy resigned from the FBI in 1962 to practice international law in Manhattan. Thereafter he served as a prosecutor, ran unsuccessfully for Congress from the 28th district of New York, then in 1968, ran the presidential campaign of Richard Nixon in that district. In the Nixon administration, Mr. Liddy served first as Special Assistant to the Secretary of the Treasury; was then appointed Enforcement Legislative Counsel, authored the Explosives Control Act and, in 1971 was sent to the White House as Staff Assistant to the President of the United States. At the White House, Mr. Liddy had oversight responsibility for Treasury policy on firearms and explosives and authored the memorandum that led to the creation of the Drug Enforcement Administration. Subsequently he was assigned additional special duties as a member of the top secret White House Special Investigations Group. Mr. Liddy resigned his White House post to accept the positions of General Counsel of the 1972 Republican presidential campaign and the campaign finance committee, with additional duties as campaign political intelligence director. The rest is history. For his role in Watergate, and for refusing steadfastly to implicate others, Mr. Liddy was sentenced to over twenty years in prison. He served nearly five years, many in maximum security, including 106 days of solitary confinement, before his release by President Carter "in the interests of justice". Rated by the Treasury Department as a pistol expert whose draw and hit was timed electronically by the FBI at 60/100 of a second, Mr. Liddy was once specially assigned by the Secret Service to protect President Eisenhower. He is an FAA licensed pilot and a life member of the Special Operations Association. He has authored five New York Times Best Sellers as well as hundreds of magazine articles. His latest book, "FIGHT BACK Tackling Terrorism Liddy Style", published February 14, 2006, ranked high on the New York Times bestsellers list within two weeks of hitting bookstores. Mr. Liddy has lectured extensively, from Berkley to The Oxford Union. He is an actor in motion pictures and television including co-starring roles in Miami Vice, Airwolf, MacGyver, Feds, Perry Mason and 18 Wheels of Justice. Mr. Liddy is also a frequent guest on Fox Television’s Hannity & Colmes, and other top rated news shows on MSNBC, CNN, and CNBC. In 1992, Mr. Liddy enrolled with the Israeli Defense Force Paratroop School at Tel Nov, qualified for, and was awarded his wings. In October 2001, he re-qualified, and has made three additional jumps with the elite IDF parachute regiment. In January 2003 he was bestowed the honor of leading the stick out of the aircraft. In August 2003 and July 2005, he rode his Harley Davidson motorcycle the full 1,846 miles from Washington, D.C., to Sturgis, South Dakota for the 63rd and 65th annual motorcycle festival. He’s also ridden with the Los Angeles chapter of Hell’s Angels and is a member of the Honor Legion of the Police Department of the City of New York. In November 2005, having just celebrated his 75th birthday, The G-Man was selected to compete in the highest rated reality TV show, NBC’s Celebrity Fear Factor. The show will air, summer 2006. On March 3, 2006, Mr. Liddy hit the ground with Pentagon Officials in Iraq and Kuwait. Having spent two weeks on the battle lines with U.S. Military, he has much to convey about the war in Iraq. Mr. Liddy’s lecture audiences have ranged from an association of independent over the road truck drivers to the Oxford Union and, according to The Wall Street Journal; he is "one of the most sought after speakers in the nation." 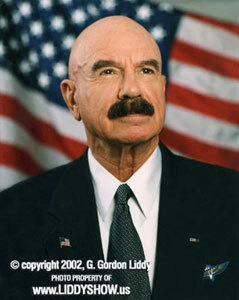 Today, Mr. Liddy is the host of THE G. GORDON LIDDY SHOW. His nationally syndicated radio program celebrates 14 years in February 2006. The show is broadcast in more than 150 markets and is heard on Sirius and XM satellite radio and around the world via internet streaming.